Use Excel formulas to calculate everything. 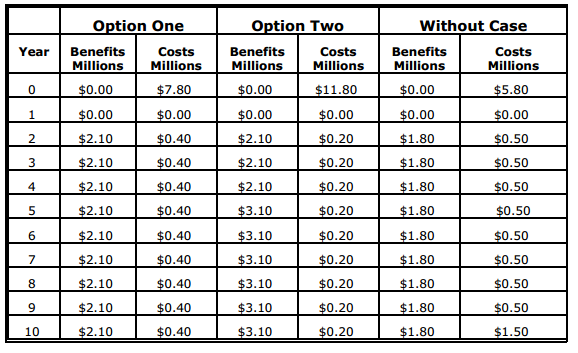 There are three alternative plans that indicate the benefits and costs associated with the construction of a Manitoba hazardous waste facility (see table on next page). a. For the three alternatives calculate the net present value and benefit-cost ratio for four different discount rates (0%, 6%, 12%, 18%). You must use Excel or some other spreadsheet program and do not use the built in formula for net present value. b. Create a ranking for each of the discount rates based on their net present values. Based on the ranking which alternative would you choose at each discount rate? c. On a single graph show the impact of discount rates on net present value for each alternative. The vertical access should be net present value and on the horizontal access should be discount rate. Indicate on the graph the lowest approximate discount rate where each alternative should not be undertaken.